Clear to partly cloudy. Low 47F. Winds WNW at 5 to 10 mph..
Clear to partly cloudy. Low 47F. Winds WNW at 5 to 10 mph. Brandi Greene Kendrick, Luther Girado and Julie Girado Turner at the Historical Kawaiisu Preserve. The most common belief today is that the word Tehachapi derives from the Kawaiisu word "Tihachipia," meaning a hard climb. 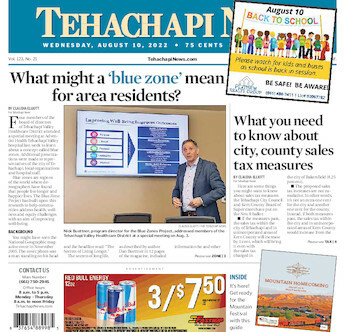 Visitor Guide: What does 'Tehachapi' mean? There is no place like Tehachapi — and no other place named Tehachapi. So just what does the name mean? The name entails the higher elevation of the city. In fact, the higher elevation of the city is the competitive differentiator because it produces clean air, four seasons, alternative energy, outdoor adventures and great agritourism. While searching the west for the U.S. government to find a railroad route to California in August 1853, Lt. R.S. Williamson and his scout, Alexis Godey, made their way to the Tehachapi Valley and Indians told them their name for the creek running there was "Tah-ee-chay-pay." Williamson did not record the meaning of the name, however. Speculation abounds, and through the years, various meanings have been attributed to the word. Multiple spellings have been used, as well. The most common belief today is that the word derives from the Kawaiisu word "Tihachipia," meaning a hard climb. "... a steep continuous descent for eight or nine miles, when we found ourselves in a beautiful prairie, apparently completely surrounded by high mountains, and as far as the eye could tell, it was a horizontal plain. "There was another rancheria close to the place selected for our camp, and from the Indians we learned that their name for the creek was Tah-ee-chay-pah. It is the one called Pass Creek by Colonel Fremont, and is the same one he ascended when he crossed the mountains in 1844."